We highly suggest to go there and ask questions but feel free to post them here too. The below commentary is mostly a summary with references to An Younggil's one and a few expansions by SL deshis. According to An Younggil many of the choices here are psychological and of second order: Lee's choice to play the Chinese Opening of - - , which he usually does not play, Gu's choice to play instead of the currently common a, to forestall any preparation Lee might have done and rely on his (Gu's) superior opening intuition instead. As a negation of the influence generated by the right side, is usually at a. An Younggil is again supportive of Gu Li's good intuition, which prefers here. After it seems we are moving into a dull game, which each side having staked out two areas. 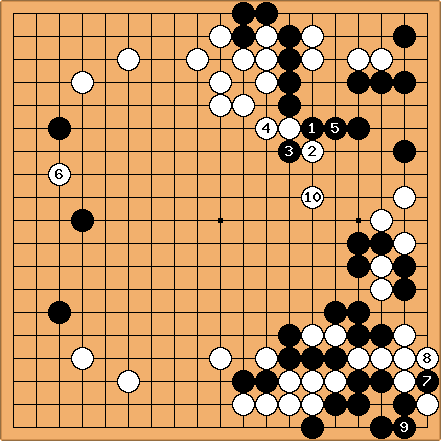 To me the opening especially looks passive for Black, who should use the initiative to pressure White and overcome the komi. As such I can understand , an attempt to break up the top, with many variations of the crosscut leading to extra central influence to build a moyo from his right side structure. An Younggil provides standard sequences for the hane and crosscut or counter haneand explains why is the better choice. Likewise he prefers the turn at to a cut. An Younggil discusses vs playing directly. Both are implementations of the driving tesuji. is blighted. To the amateur's eye, Black's top right corner is big. To the professional's eye, White's thickness prevails. ends the exchance at the top. Clearly a hane by White there would tilt the exchange between territory and influence in white's favour. 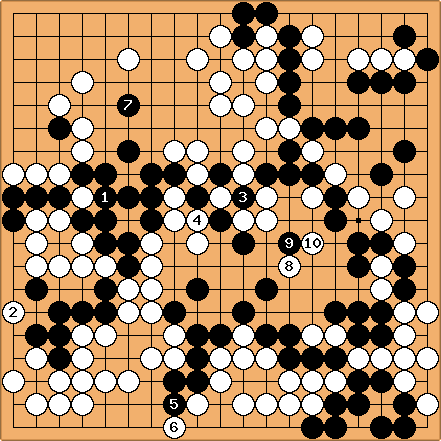 The central theme of this game is White's invasion of the lower right, with and . The awkward attachment of is thoroughly assessed by An, and he thinks it is a mistake. is a counter, cutting through the black lines and ignoring as it stands. The major issue is: will White live easily? Black is trapped in a loose ladder. If he realizes this by move , and tries moving out with , then puts black's cutting stones in atari and Black must choose between a and b. Hence, it is better not to move out with . It looks as if White does collapse, after . See the evaluation of the lower right: /KoInLowerRight An Younggil then explains the marvelous sacrifice tactic by Gu Li, starting with . For the amateur's eye it is difficult to see how this sequence could be a success for White. He will lose the capturing race in the bottom right and the three stones - - don't really look like a solid foundation either. Let's start with the latter: usually Black would be able to destroy the shape by playing atari at a. However, White will play the ko at b. 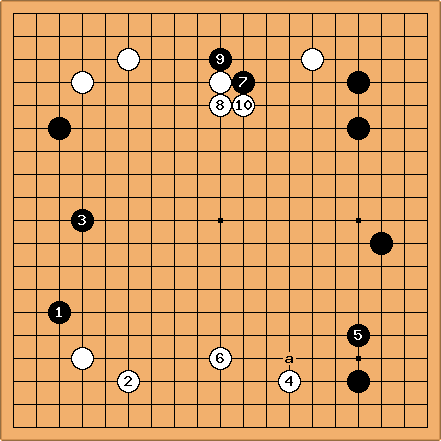 It is a heavy ko for Black, because if he loses it, - will perish and White's whole group lives easily, which was the central theme of this game. To go back to that poor white group, it loses the race but there's still tons of aji about, if only for the Black group at the bottom not having two eyes himself. If we take a step back and look at the whole board, the situation hasn't really changed to White's disadvantage. The right side is still Black's but there's high voltage in the area. White can use the situation as a source of ko threats, can play on the outside threatening to link up all those lost stones, mvoe out at c ... In effect, White is playing actively in Black's area and as such it's a success. White is really enjoying himself, because , and do more of the same: they create aji but do not intend to survive per se. If Black responded as to decrease the pressure from the outside, they could perhaps live inside. That's what they call probing. Eventually the attachment of reveals what this was all about: even more central influence. Incidentally, An Younggil explains that may have been a bit greedy and was benificial at this stage, providing more thickness]. After having acquired all that strong influence aka thickness, puts it to use by splitting Black's three space extension at its vital point. Such an invasion can result in many variations, which An Younggil dutifully explains. A ko can be found in many of those and obviously the lower right is a burden in that respect. With and , Lee tries to reduce the pressure in that area, before it boils over, giving White the initiative at the left. If White now plays a second time there, Black may resolve to sacrifice tactics, or sabaki, instead of trying to cling to his position here and simultaneously keep the lower right under control. White, facing the extinction of his precious aji, plays to reach out for the lost stones, while increasing central influence and play a role in any fight spreading from an attack on . In order to understand this, one needs to follow the great analysis by An Younggil as referred to throughout this commentary. is an unusual way to deal with the invasion stone and An Younggil disapproves of it. See the SL descriptions of this invasion pattern. 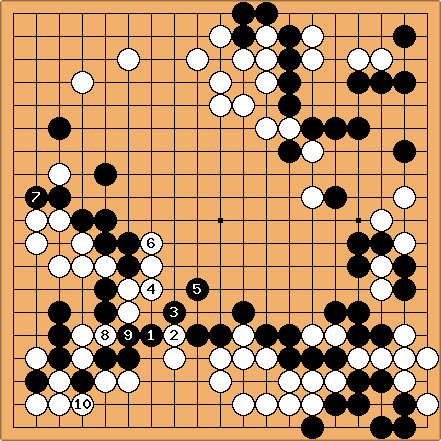 White uses a common attach and crosscut tactic to divide the area between both. As a result is isolated and the lower left gets the aspect of a white moyo. Due to White's strength at the top, Black's group a the left isn't all that alive and kicking either. Usually, responding with at a is a grave mistake and one should play here, capturing the stone, because next Black's a is not that serious, and White has the option to cross under at in good shape. However, here creates a safe position for Black, while in the game White has a nasty attachment at b to aim for. This is one of the instances where beginners and pros may play alike and amateur dan players miss the mark. Just like , deals with the stones on the right, while exerting a maximum amount of influence on the proceedings in the centre. Again, you should read An Younggil's analysis to understand this. As the temperature on the right is now reduced, White turns at to expand his moyo and weaken the group above. Black now uses evident sabaki technique of the attachment and counter hane . The situation at the left mirrors the right, reversing the roles: Black needs to deal with his stones in White's sphere of influence. White must make sure they don't live too easily. According to An Younggil, this is how Lee Sedol prefers matters. He specializes in complicating such a situation, often at the expense of the stronger party. 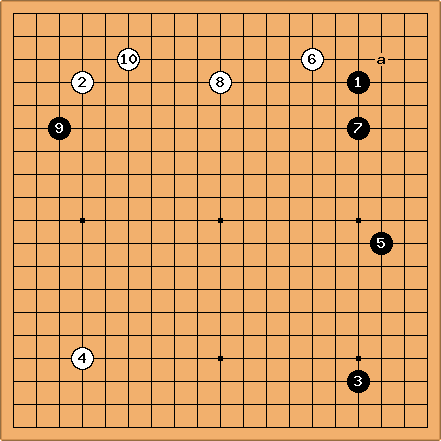 Indeed Gu Li tries to simplify things with and according to An Younggil this is a mistake. The move has the opposite effect because it gives Black more freedom to complicate matters, starting with the attachment at . We can see returning patterns: attachments as sabaki techniques, "making something out of nothing". While such pattern is known to an amateur, it takes a pro to come up with a move like . 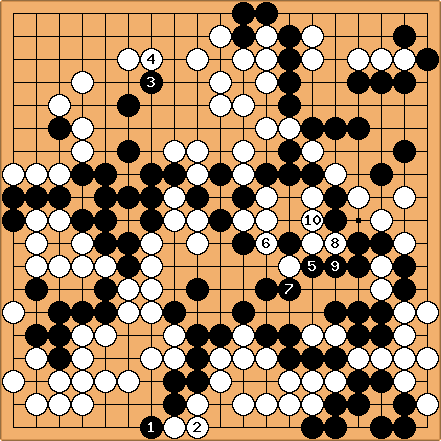 With , the centre suddenly comes under Black's influence. The tactics are again mind boggling. According to An Younggil, is a mistake allowing to stick his head into what would otherwise have been able to become a huge black central moyo. What's worse, White seems to be able to play the strong hane of , instead of the more cautious a. This subjects the white stones to shortage of liberties, if Black were to cut at b but Gu is ready to cope with that aji. It hence came as a shock to see , a typical greedy move by Lee, who was still very busy catching up on points, instead of exploiting weaknesses in White's position. 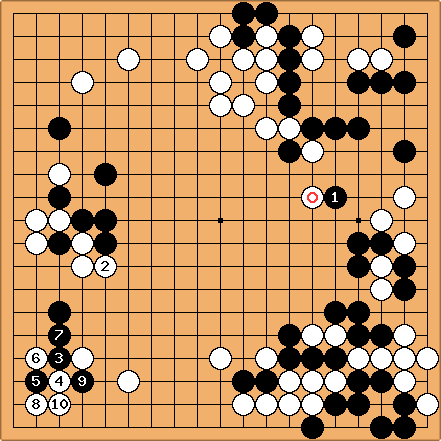 Gu did not hesitate and captured three stones at , giving up territory on the lower side but removing all aji in his position. 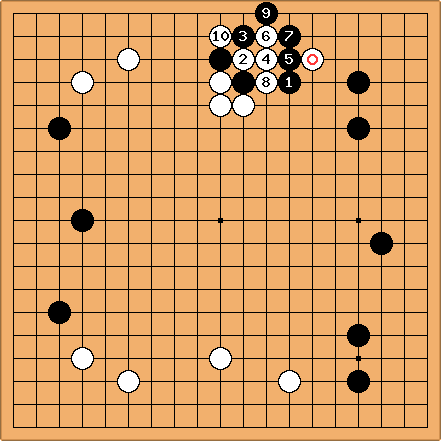 An Younggil considers to be the losing move. Although the lower side is destroyed, Black needs to come back at to defend against the atari and cut at a. 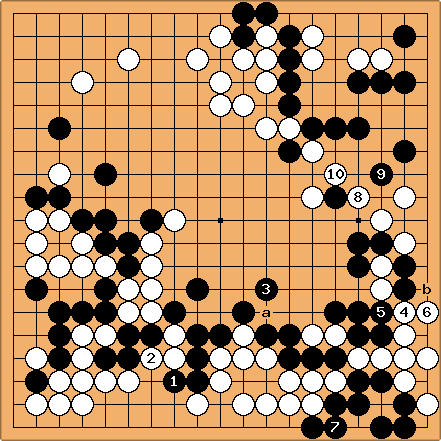 The fact that Black needs to play such a defensive move so soon, may expose the mistake at in the previous diagram. 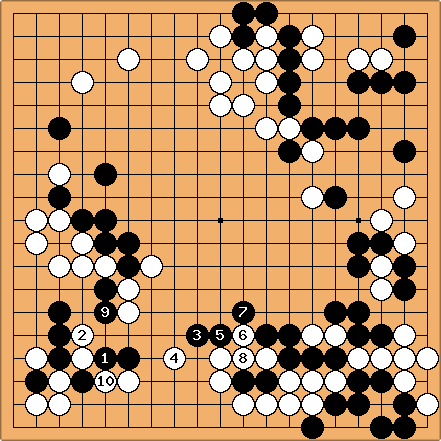 The game now having tilted in his favour, Gu Li sets about exploiting the aji in the lower right to simplify the game. and link up to the stones above, due to the shortage of liberties at b but White still has no two eyes. However, the moves are free, because Black needs to respond at and . If we consider the number of moves Black has spent on this position, we start to appreciate the amount of aji it had and the consequent conclusion that the early middle game was favourable for White. and prepare to link up but White still is not strong enough. White now sets the left in motion with , keeping a keen eye on the connection at a. transforms the upper left into potential white territory, while keeping the pressure on the black group. These two fights have remained intricately connected throughout the game, as you can appreciate from An Younggil's analysis. Black is fighting on the left with one hand tied behind his back. We now appreciate the value of White's thickness, which in the beginning was said to be worth more than Black's top right territory. In this diagram, we see how the two sides join. Black tries to maximize the centre but White keeps it relatively small. finally captures the white group that has lied in wait to escape for so long. 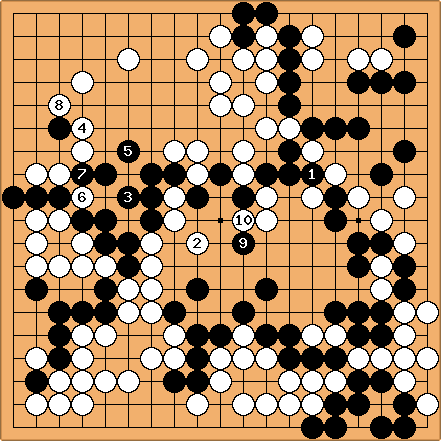 After , Black's left group cannot break through the lines anymore and must live on its own. is the only move for that and looks rather cramped, but the real mistake is . 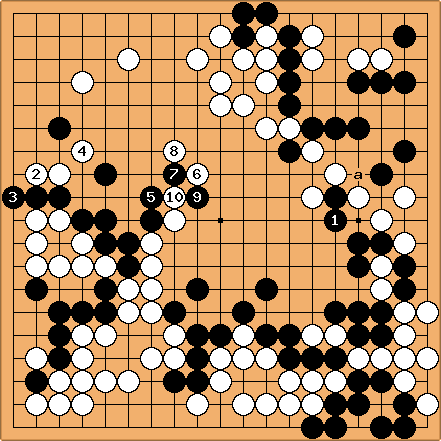 If it were played at , the aji of the captured black group in the lower right would become more active. reduces liberties at a small cost and thus removes the aji. Again, for mere mortals this is only intelligible through An Younggil's careful analysis at gogameguru. turns the top left into territory. It now looks like victory cannot escape anymore. We leave the ko at - aside. keeps control of any capturing race that would start here after gains liberties for his chain. Black resigns after . It is estimated that White's advantage is about 5,5 points.